Hey guys, those keen racers out there may be aware that a new DLC pack has launched on the XBOX LIVE Marketplace today. 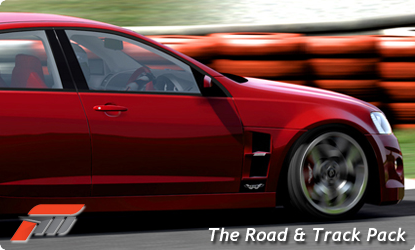 "....The wait is over today, as we reveal the cars that were hidden in the Road & Track feature this week. The April Road & Track™ Car pack is here, bringing with it 10 awesome vehicles which will, without a doubt, continue to diversify and beautify your Forza Motorsport 3 garage. This month’s pack is running a wide array of car types from the 2010 Ford Taurus SHO, the MX-5 Superlight, to the Mini Coupé Concept, there is definitely something for everyone in this pack. Also who can forget the w427, a car many Aussie’s have been asking for since the release of Forza 3, the 500 horsepower Holden HSV w427 is here and ready to be raced, tuned, and painted to your heart’s content! Road & track is one of the best sources for car news in the world, so what would a car pack bearing their name be without a plethora of information to go with these new cars. Be sure to click on the names below to access the Road & Track DLC stat sheet, there is a fact sheet available for each vehicle presented in this month’s car pack. Each sheet has in-game photos of the cars and a lot of car specs which should give you a good idea on where you can take these vehicles once you pick up the pack. Available April 13th on the Xbox LIVE Marketplace, priced at 400 MS Points......"